Sock twins! If you make a note of EXACTLY where you are in the yarn's pattern repeat when you cast on for your first sock, then you can find that same place when you cast on for the second sock. Voila, sock twins. This is Trekking XXL, color 134 for those of you who are wondering. I thought today I'd share a few tricks I've learned while making socks and hopefully make your sock knitting experience easier, or at least spare you some heartache. Those of you who know me personally know that I can be a little obsessive compulsive, but I've found that for socks that can be a good thing. If I do certain things the same way everytime, I don't really have to think about doing it, and the socks get knitted faster. 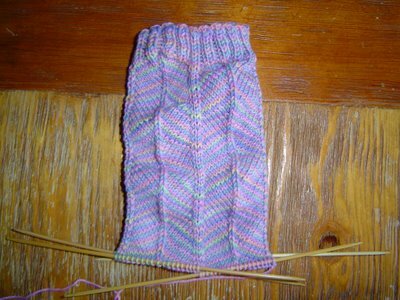 First of all, I used to just measure how long a certain part of the sock was, but I found that on the second sock, as I was getting impatient and wanting to finish the pair, I would stretch the sock a little more when I measured it and I'd end up with one sock longer than the other. I now use a row counter. My new favorite is the Mini Kacha Kacha, which hangs around my neck and, unlike the original Kacha Kacha, has a lock on it so 5 year old boys can't just go nuts with the thing. 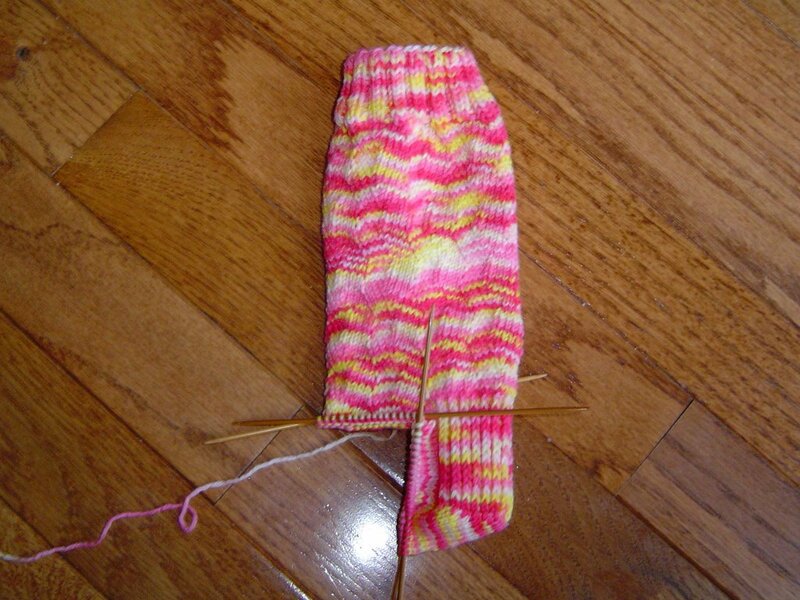 Now I just make a note of how many rounds go into the leg on the first sock and I can match it on the second sock. I also use it to keep track of rounds on the foot as well as my rows on the heel flap. Because I use the row counter, I developed a new obsession - I do decreases on odd numbered rounds. I use this on gussets and on the first part of toes when you decrease every other round. This way, I don't really have to think about it, if I'm working an odd numbered row in these parts of the sock, I decrease. Even if a pattern is written so that decreases will fall on even numbered rounds, I do them on the odd rounds. At this point it has become a habit and keeping the habit makes it faster for me to knit the socks. 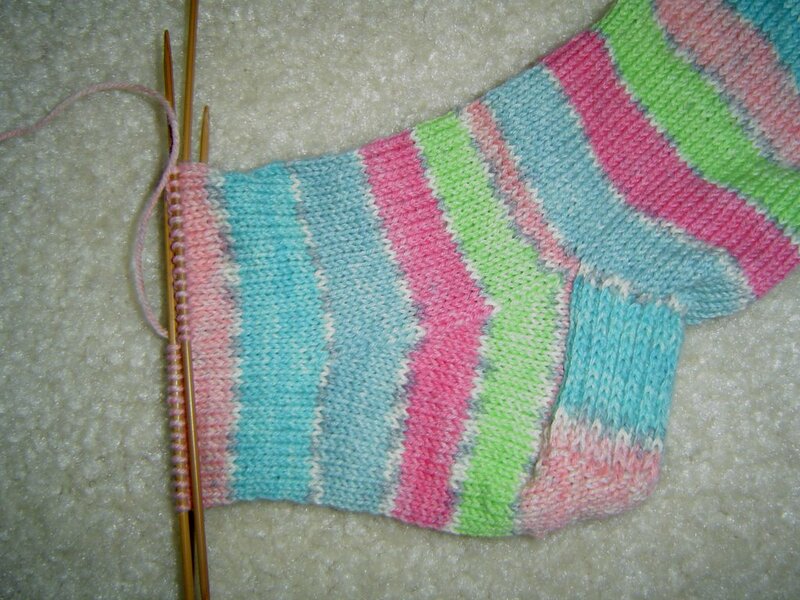 I really prefer to knit socks with 5 DPN's and the only reason I would only use 4 is if Nancy Bush told me to. I like to keep Needle 1 as the first needle for the instep stitches. This puts the end of the round at the side of the foot, but to me it means less juggling of stitches later when you get to the toe. I always mark the Needle 1 by hanging a Lock Ring Marker off of that part of the sock. Some patterns place the end of the round on the bottom of the foot, but I tend to adjust the pattern, unless its very complex or Nancy Bush wrote the pattern. I don't mess with Nancy Bush. She is a sock genius and knows things about socks that we mere mortals don't even know we're missing. If you don't have her books, go get them. You don't even have to knit to own her books - they'll sell them to you and you will have books of glorious socky eye candy to read whenever you want to! I owned Folk Socks for years before I started knitting socks. I don't see anything crazy about that. Now that I've truly terrified you with my personal kind of crazy, I'll share a few things I've learned about different yarns and stitches. Most people realize that cables tend to eat up your stitches per inch and lace gives you more than the usual stitches per inch, but there are other factors that affect the stretch of socks. Ribbing will pull a sock snugly around the foot, but when its completely stretched out, it has a fewer stitches per inch than stockinette does in the same yarn, on the same needles. Socks that have a stitch pattern that makes diagonal zig zags or arches have less stretch than straight stockinette - Jaywalkers and the Melanie's Twist stitch pattern both do this (although Melanie's Twist is more elastic than the Jaywalker pattern). This is why Feather and Fan socks, while a lace pattern, aren't as elastic as other lace patterns. 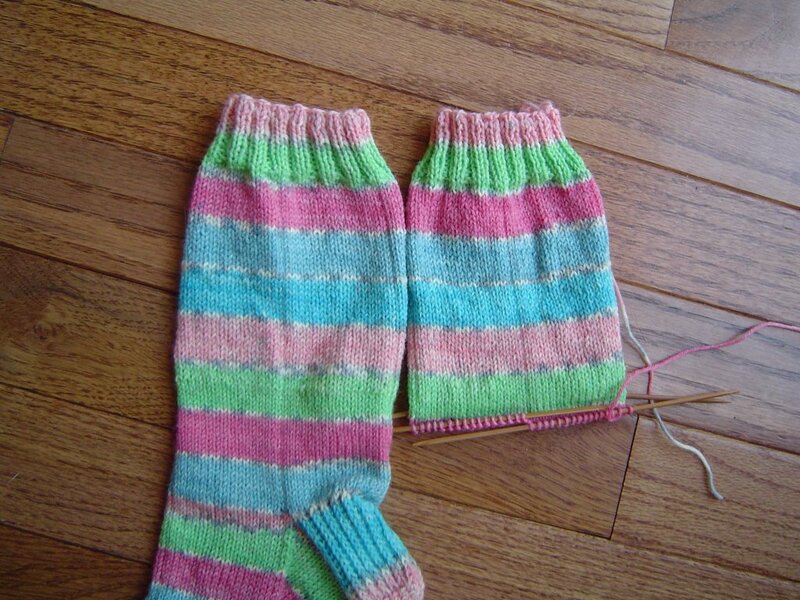 Some yarns can affect the stretchiness of socks too. As a handspinner, I tend to use medium wools blended with mohair for socks because of the strength they give the socks. Most medium wools don't have as much crimp (the shape of the fiber that gives it bounce) as fine wools do which results in less elasticity. I like to use a stitch pattern that adds elasticity for my handspun socks - ribs or the waffle pattern are good examples of this. I also don't use negative ease on the feet of my handspun socks. That's about all I can think of to tell you about socks. The best advice I can give is to just knit them. Keep on knitting the silly things and you'll figure out what works best for you, your knitting style, and your foot and leg shape. Plus, you'll have warm feet all winter. OK, so at this point, you've knitted all the way down the cuff, done a heel flap and heel turn, made your gusset, decreased your gusset and you're ready to do toes - right? Before you begin a toe, you have to know where to put it - no, the end of the sock isn't the right answer as anyone who has ever worn socks that were too short knows. 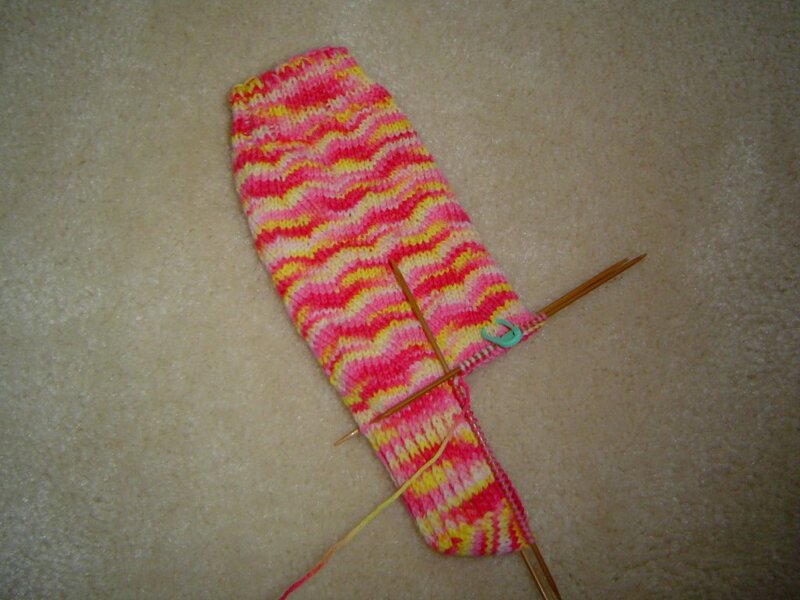 You have to knit the foot just long enough so that your toe ends up being the perfect length for your foot. Most directions will tell you to knit the foot for as long as desired or about 2 inches short of your desired finished length. I learned a better way to know when to start my toe, and it hasn't failed me yet. I learned it from comments you guys left on my blog. 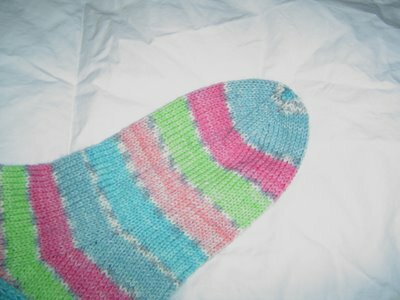 So, as you're knitting your foot, try on the sock periodically and when the knitting reaches the place on your foot where your big toe connects to your other toes (where a flip flop would go), you're ready to start your toe decreases. This has worked on every sock I've made - mine, Caleb's, and my Sockapaloooza sock pal's (we have the same foot length measurement so I cheated). I haven't knit Mickael socks yet, but I see no reason why it won't work there either. OK, so you've knit down to where you need to start toe decreases, how do you do those? Easy. Remember your first cast on number of stitches? 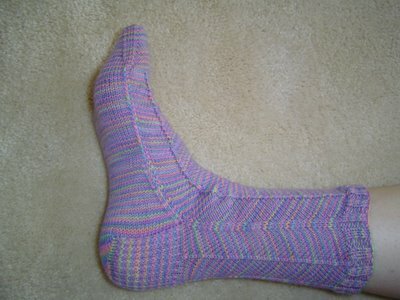 In my sample sock I cast on 64 stitches. I will work a toe decrease round (I'll give details in a minute) every other round until I have half the original number of stitches (32), then I'll work the decrease round every round until I have one quarter of the original stitches (16) left. Then I Kitchener Stitch the toe closed and admire my sock! If you get an odd number when you are figuring the last number, you can either round up or down. Use your foot type as a guide. My feet tend to be narrow so I always round down, but if you know you have wide feet, or just like toe wiggle room, round up. Now that you know when and how many times you're going to decrease, how do you do it? Easy, the decrease round looks like this:Needle 1-K1, SSk, knit to end of needle, Needle 2-Knit to last 3 stitches, K2tog, K1, Needle 3- work as for Needle 1, Needle 4- work as for Needle 2. This only works if Needles 1 and 2 are your instep stitches and Needles 3 and 4 are your sole stitches. 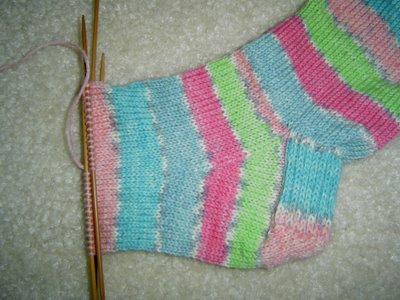 So once I have my socks at the correct length to start toe decreases I would work this round every other round (working even for the alternate rounds) until each of my 4 needles has 8 stitches (32 stitches), then I would work only the decrease round until each needle has 4 stitches (16 stitches). Then I Kitchener Stitch the whole thing together. Kitchener Stitch is something that used to give me fits so I learned a way to Kitchener Without Knowing How To Kitchener and you're welcome to do this technique as well. I got into trouble when I decided to make socks for the Knitting Olympics - cheating at Kitchener takes more time and I needed that time to start another sock. Yes, I've learned to Kitchener Stitch, and after making 18 1/2 pairs of socks this year, I've learned to do it without looking up the directions. 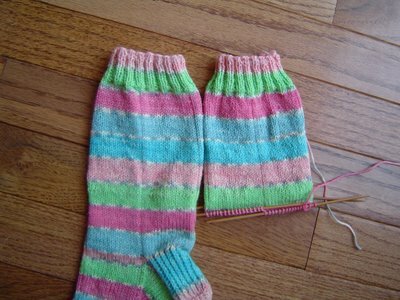 I learned from the book Sensational Knitted Socks. It has written directions for what you are supposed to do as well as really good pictures and for the first time in my life I was able to get something that looked like what Kitchener is supposed to look like. If you have trouble with Kitchener, take a look at this book and see if it will help you. Congratulations! You just finished a sock - now knit another one for your other foot. Tomorrow I'll share some tips, tricks, and highly obsessive compulsive things I do when I knit socks. Gussets. Gussets are not my favorite part of a sock, but they are important for the fit and honestly, I always feel like once I complete the gusset, I'm on the home stretch. Here's how I do them. After I've completed my Heel Turn, I divide those stitches on two needles again. The working yarn is at the left end of the heel turn, so with that needle, I begin picking up stitches along the edge of my heel flap. (If you've never knit a sock and have no idea what I'm talking about here, don't worry, go knit a sock and come back after you're done with the Heel Fap and Heel Turn - some things are easier with yarn and needles in your hands.) Because I've slipped a stitch at the first of every row on the Heel Flap, I have a nice line of slipped stitches on each side of the flap, to pick up. Let me digress here and say that by picking up stitches along the heel flap, I'm not picking up stitches that I've already made. I am lifting a stitch I already made and pulling a loop of the working yarn under it with my needle. That loop of working yarn is the stitch that I've picked up. OK, back to the picking up of stitches. You want to pick up one stitch for each slipped edge stitch on your heel flap (there will be half the number of slipped edge stitches as there are rows in your heel flap - my example has a 32 row heel flap, so I have 16 edge stitches). Then, I pick up one or two extra at the little V joint where the heel flap joins the leg of the sock. This makes sure I don't have a gap or hole there - that's important because that is a stress point in the sock. Most sock patterns will tell you how many stitches you should pick up along the heel flap but I've always pretty much ignored them. You should pick up as many as you need to to make the gusset attach to the heel flap without holes. Sometimes that's more stitches than the pattern recommends, it might be less. Do what you need to and don't worry too much if you have the exact same number of stitches as the pattern does. After you've picked up stitches along the first side of the gusset, that needle will have half of the heel turn stitches and your newly picked up stitches. I think of this needle as Needle 4, the last needle of the round. You'll want to knit across Needles 1 and 2 in whatever pattern you were working. Then, with your empty needle, pick up and knit stitches along the second side of the heel flap, making sure to get a few extra at the joint where Needle 2 and the heel flap come together. Try to get the same number of stitches as you did on the first side, but if you need more to make sure there are no holes, that's fine. I've never had anyone wrestle me to the ground and count the number of stitches on the gussets of my socks. After picking up the stitches on the second side of the heel flap, with the same needle, knit the second half of the heel turn stitches. 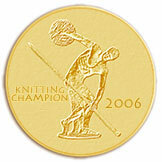 You now have to knit the stitches on Needle 4 again to get all the way around the round. I like to knit through the back loops of the 2 or 3 extra stitches that I picked up because it will tighten them up a bit. You've now knit the first round of your gusset. I like to work a second round without any decreases (I will also knit through the backs of the first few stitches on Needle 3 on this round) because it gives me a little bit of wiggle room to get away from the round of picking up before I start decreases. Also, I like to work my decreases on odd numbered rounds - staying consistent with this means I don't have to think about it. 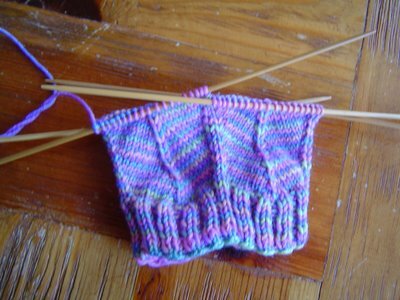 OK, so round 3 of the gusset looks like this: Needles 1 and 2, work as established, Needle 3: K1, SSK, knit to end of needle. 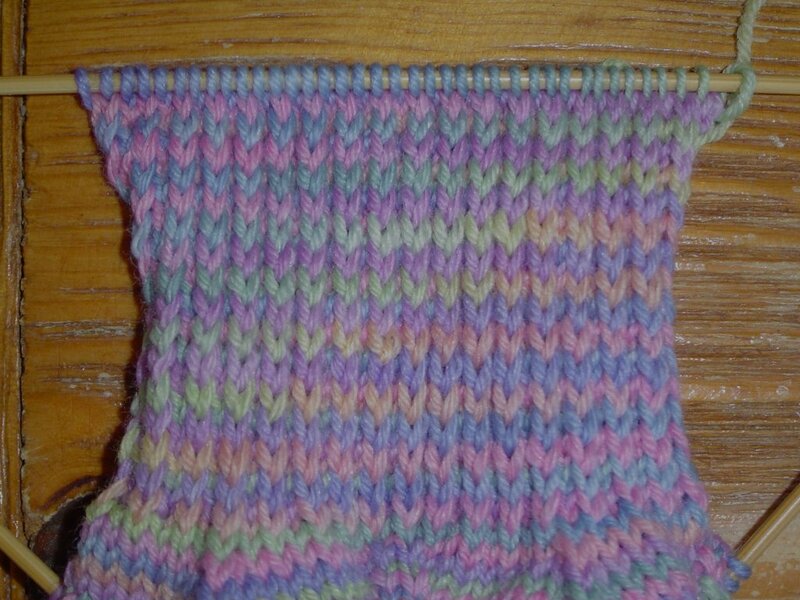 Needle 4: knit to last 3 stitches, K2tog, K1. The following round I will work even, with no decreases. I repeat these two rounds, decreasing every other round until I have decreased back to my original stitch count or whatever stitch count I will use for my foot. On the first day, someone made a comment asking about negative ease, so I'll address it now. I like my socks slightly loose on the leg, but I like them to fit snugly around my foot. In order to get this, I have to take ease (the difference between a garment's measurements and the body's measurements) into account. In stockinette stitch, I like to have negative ease on the foot part of the sock so that the sock doesn't get bunched up in my shoes. Negative ease means that the garment is smaller than the body part it goes on. Because the ball of my foot is 8 inches around, I will make the foot of the socks smaller than 8 inches around (usually by about 10% or so). Since 90% of 8 inches is 7.2 inches and I'm getting 8 stitches per inch on my gauge, I need to continue my gusset decreases until I have 57.6 stitches. Since 57.6 stitches is impossible and I need a number that can be knit and I like a number divisible by 4, I can either decrease to 60 stitches or 56 stitches. In this case I decided on 60 stitches - I can't really tell you why right now. Perhaps with more caffeine and later in the day the reason will become clear to me, but at the moment, I'm just not sure. Once I've decreased my gusset stitches until I am down to 60 total stitches, I can redistribute the stitches evenly on the needles and continue knitting for the foot. A few things I want to mention about negative ease - certain stitch patterns are less elastic so you don't need to have negative ease to get a good fit. I also never use negative ease on kid's socks - they grow too fast. Finally, people with certain health problems don't need tight fitting socks so you want to be careful when knitting socks for them. I'll discuss different stitch options after we've finished the sock. Tomorrow - Toes! This is the second time I've done this post, since the first got rudely eaten by the computer. Today is heel flaps and heel turns. I work my heel flap on half of the total number of stitches in the sock (in this case 32 stitches for the heel). When I've finished my last round of leg stitches, I turn my sock around and slip 1 and purl 31 (if you have a different number of heel stitches, the number you'll purl will be different - just make sure you slip the first one and purl the rest until you have half of the total sock stitches for your heel flap. This WS row is the first row of my heel flap. 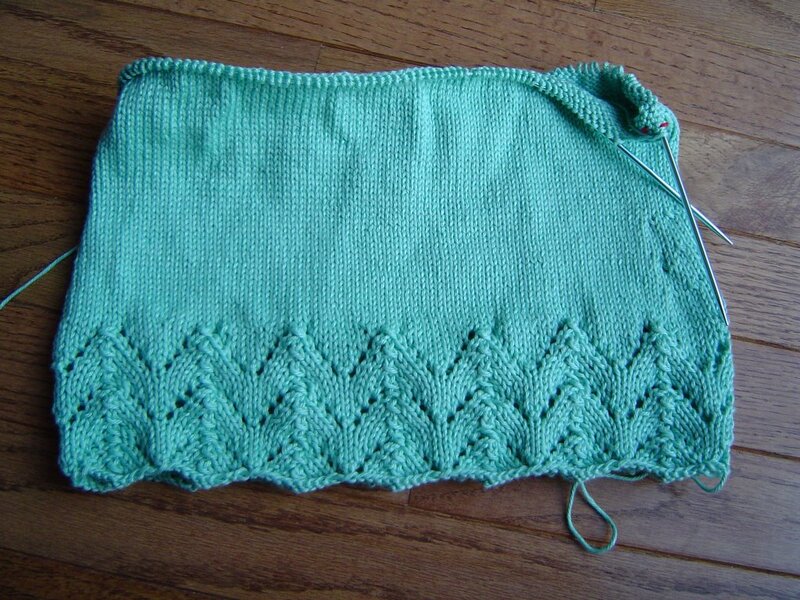 The next row is a RS Row and goes like this: *Slip 1, Knit 1, rep from* to end of row. These two row form Heel Stitch and you'll want to knit as many rows as you have stitches in your heel flap (in my case 32 stitches, 32 rows for the heel flap) - this gives you a roughly square heel flap. You should have finished on a RS row so to start your heel turn, you'll be working a WS row. Row 1 of Heel Turn: Slip 1, Purl half the number of heel flap stitches (on my sock that's slip 1, Purl 16), Purl 2 Together, Purl 1, turn. Row 2 of Heel Turn: Slip 1, Knit 3, SSK, Knit 1, turn. 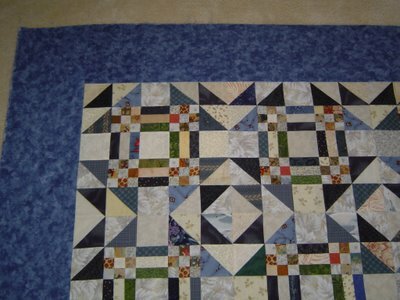 Now you will have two little "gaps," one on either side of your center stitches where you turned your work. Work the following two rows as many times as it takes to use all of the heel flap stitches. Row 1: Slip 1, Purl to 1 stitch before the gap, P2tog, Purl 1, turn. Row 2: Slip 1, Knit to 1 sitch before the gap, SSK, Knit 1, turn. Each row will add two more stitches from your heel flap to your heel turn. Once you have used all the stitches, you're ready to start the gusset - we'll do that tomorrow! I've started another sock and it occurred to me that I had never shared my own formula for a generic sock. Most people who have knit several pairs of socks adopt certain ways of doing them so I thought I'd share mine. This is in no way a copyrighted technique so feel free to use it, adapt it, or ignore it at will. 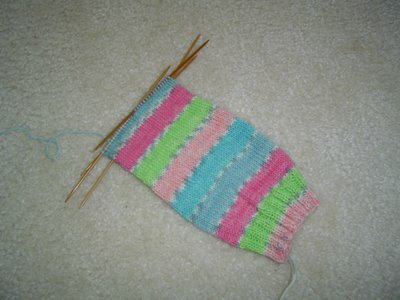 This is how I knit a sock with any yarn at any gauge. The first thing you need are a measurement and a gauge. I measure around the ball of my foot which is 8 inches. Then, if I've never knit with a yarn and I'm not sure what gauge I'll get, I cast on 24 or so stitches and knit back and forth for a couple of inches. The experts will tell you that your flat knitting gauge is different from your circular knitting gauge, but for my purposes, this has always gotten me close enough. With a ruler on top of your gauge swatch, count the number of stitches per inch. I like to use a clear Omnigrid ruler for quilting because I can count stitches through the ruler. I don't worry about counting row gauge because I measure the length of the sock on my foot as I go. Once you have these two numbers, you're almost ready to go. The next thing you have to do is to figure out how many stitches to cast on. Since this yarn (Trekking XXL, color 134) knits up at 8 stitches per inch and my foot is 8 inches around, I cast on 64 stitches. (stitches per inch x inches around foot = approximate number of stitches to cast on) I say approximate because you might want to tweak the number a bit - its easier to work with numbers divisible by 4 (if you use 4 double points), and if you're using a stitch pattern (more about those later), you'll need a number divisible by the number of stitches per repeat. For this sock, I'm knitting it in stockinette stitch so I can use any number I want to, 64 is divisible by 4 so I didn't have to tweak this stitch number. After casting on however many stitches I decided I needed, I join carefully so I don't twist my stitches and begin a K2 P2 rib. On the first round, I hold the tail left from the cast on (I do a long tail cast on) along with the working yarn and knit the two together. This begins the weaving in of that end. After the first round, I drop whatever is left of the cast on tail and just work K2 P2 rib for as long as I want it - usually around 1-1/2 inches or so. Then I switch to stockinette and, knitting every round, knit until the cuff is as long as I want it. On Monday, I'll explain how I do heel turns! Have a great weekend. Fresh Jaywalkers, hot off the needles! These are my first Jaywalkers, but not my last. All the details: Tess Yarns sock yarn in the Spring Garden colorway. Knit on US size 1's in the smallest size. Pattern is free on Magknits (I'm feeling a bit lazy in the links department today - feel free to Google). For the most part I followed the pattern. I used Make One increases instead of knitting into the front and back for my increases and there were a couple of details I changed in the heel area, but that was just because I almost always do them the same way and changing things would mean I'd have to keep the instructions with me at all times which I'm just not willing to do for a sock with a two round repeat. This is a great sock pattern and she's not kidding when she says that they don't fall down. Something about the stitch pattern gives them a bit more structure than usual. LOVE THEM! Here is the leg to the second cuff and you have to ask yourself one question - will the heel flap work its magic for the second sock or was that a one time only thing? You can see the general squinkiness of this stitch pattern as it sits there in all its bumpy glory. I can't help but wonder if working a garter ridge at the top of the cuff instead of the ribbing might allow the sock to fall into the points and valleys that the stitch pattern makes and take out some of the preblocking squinkiness. Has anyone tried this? Did it work? Did the universe come crashing down around you? Is there any reason I shouldn't try this? Let me know, and by the way - the word of the day is Squinkiness - please try to use it correctly in a sentence. If Jaywalking is a crime you better lock me up, baby! LOOK! I got my first Jaywalker done! I am in love with this sock! I know I say that about every sock I knit, but this time its real! Isn't it just yummy? This is also the strangest looking sock I've ever seen when its not on a foot. When its by itself, its kind of this sad, wrinkly lump of a sock, but when you put it on, then it becomes socky perfection. Does anyone know if Jaywalkers look better after they are blocked? I mean I'm sure it will look better after blocking, everything looks better after blocking (would I look better after blocking?) but does it lie flat like most socks do or does it always need a foot in it? Will I have to get mannequin feet to hold my Jaywalkers when I'm not wearing them? I really don't have room in my sock drawer for mannequin feet. I'm actually running out of room in my sock drawer anyway - thinking of making my bra drawer a second sock drawer - I don't think the stupid bras really need their own drawer anyway. You can't knit a bra. They could share a drawer with the pajamas. I'm off to rearrange my drawers now. Does anyone know where I can get mannequin feet? 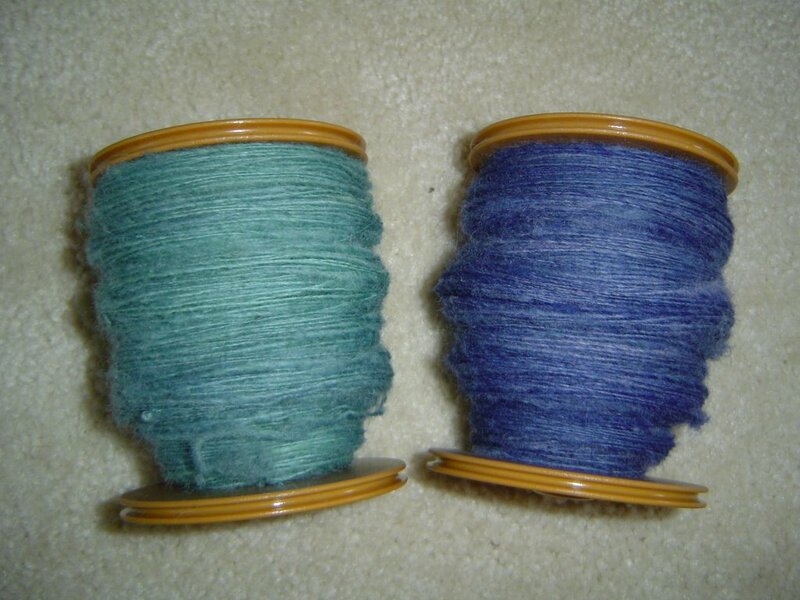 When you knit with a hand dyed yarn, you expect to get interesting results. You pretty much have to accept that you will have sock brothers rather than sock twins, but this refusal to duplicate itself identically is one of the beauties of hand dyed yarns. Sometimes you get pooling, sometimes you get flashing, sometimes you get striping, but most of the time it works out just fine and you have a project with a beauty that you just don't get with commercial dyed yarns. Sometimes, when the needle size and your tension and the exact place you are in the color repeat are all in alignment, the universe smiles at you and you get magic. Check out this heel flap: I think this is the most beautiful heel flap I've ever knit. I could frame it. I honestly don't know if I'll be able to put shoes over it. I could not have planned this if I tried. I don't expect this on the second sock and I can live with that because on this heel flap, on this sock, with this yarn, there is magic. It was bound to happen. 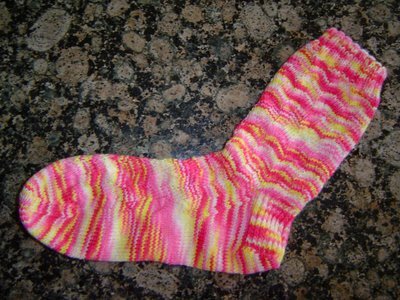 The sock crazed Pink Lemon was going to be jumping on the Jaywalker bandwagon sooner or later. I have to say, now that I've started them, I totally get why everyone is so crazy about this pattern. All these chevron stripes in two pattern rows? Bring it on baby! I'm knitting them in Tess Designer Yarns sock yarn in what I think is the Spring Garden Colorway. I just love the pastel stripey goodness. The stitch pattern takes two seconds to memorize and then you can just drag the socks all over creation without a pattern, just happily knitting zig zag socks. I can't believe it took me this long to figure this out. I finished my Pink Lemon Twisty Socks! I just can't believe how much fun these were to knit. All the details: Strawberries and Bananas yarn from Sunshine Yarns, size 1 US needles, Melanie's Twist stitch pattern with a ribbed cuff. The Melanie's Twist stitch pattern isn't too hard to memorize, but for some reason it did seem to take me most of the first sock - maybe I wasn't paying enough attention. Once I had it in my head though, it stuck there. It seems to have a higher number of rows/rounds per inch than straight stockinette. 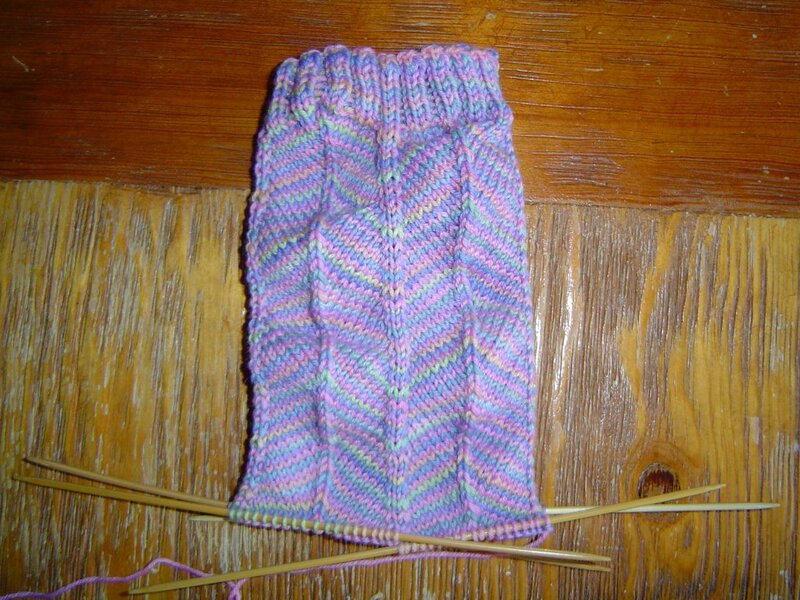 Most of my socks take about 66 rounds of the foot (including gusset) at this gauge before I start decreasing for the toe but these took 78 rounds. Not a big deal, but something to keep in mind if you use this stitch pattern. Thanks for all the comments about your favorite sock patterns. I agree with all of the suggestions and have knit all of those socks! Hmm...what socks will I do next? 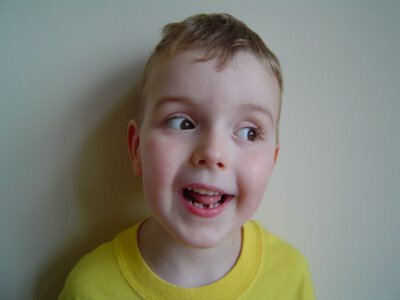 A couple of weeks ago, we discovered that Caleb had his first loose tooth (he's not quite 5 1/2 yet). Yesterday, it fell out and now we have this kind of smile: As soon as it came out, I made him a Tooth Fairy Pillow (we had gotten the fabric and pillow form already, I just hadn't sat down to sew it up). 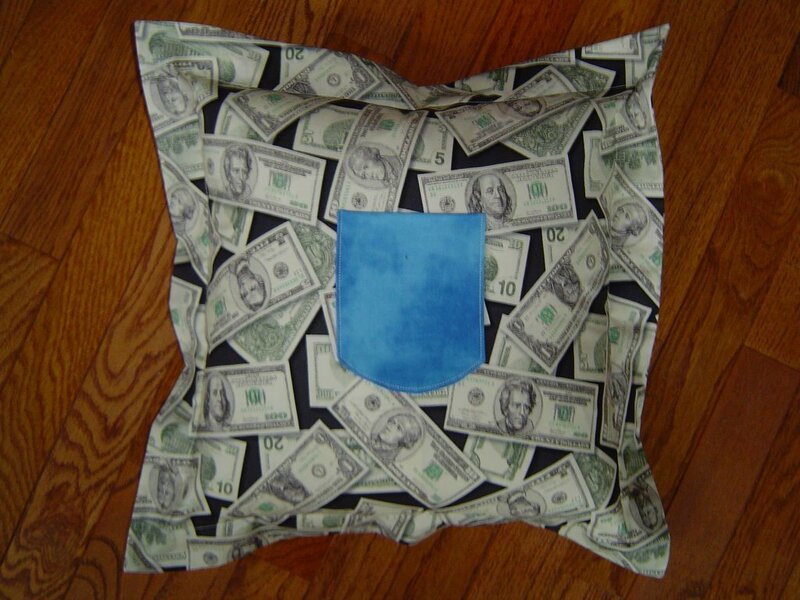 As you can see, the fabric he chose should leave no doubt in the Tooth Fairy's mind what he's wanting, but he did decide that he wanted a blue pocket to hold his tooth and the money. Thankfully, the Tooth Fairy got the message that Caleb had lost a tooth and she showed up sometime last night while we were all asleep. I have to say, I just love this age with Caleb - he's old enough to be helpful and do things for himself, but he still believes in magic. I hope everyone has a little magic of their own this weekend! 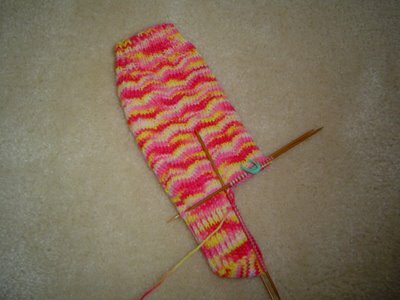 I've started on the second Pink Lemon Twisty Sock - I'm through the ribbing and the first repeat for the leg. I've had help working on it though. Ramius decided the most helpful thing he could do was to sit on my lap while I was knitting (love that - knitting with the cat - its great) but then to just make the experience really amazing, he started moving his tail around, which then flipped into my working yarn, which made him upset, which made him flip it harder, which then got wrapped up in my working yarn, so I had to untangle his tail from the yarn every few seconds. Fun. Really. Nothing like knitting with a cat who's switching his tail back and forth like a puppy on speed. Ramius has been a wonderful knitting cat since I learned how to knit. His favorite thing for me to knit is shawls because I can drape them over him while I knit. 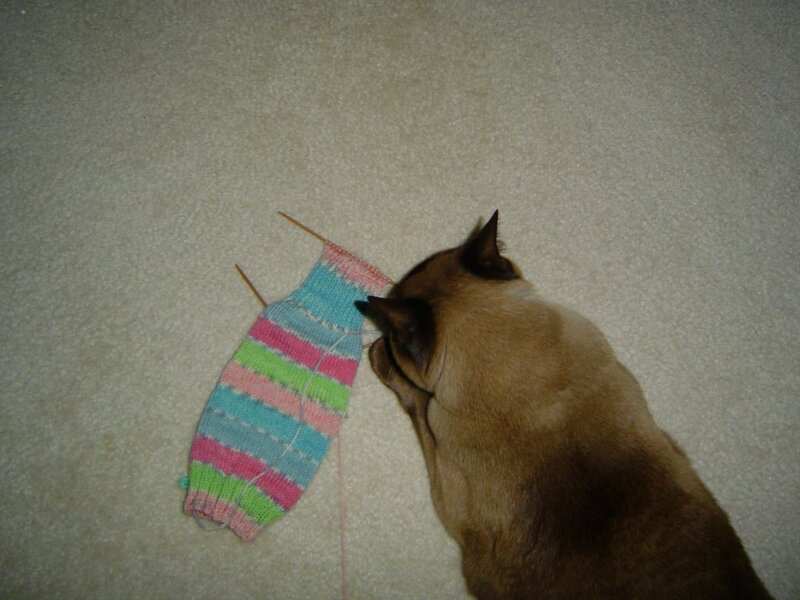 He doesn't really like socks much after the gusset because at that point they are long enough to hit him as I knit them. Last night he was a little more opinionated in his anti sock stance. I wonder if it has anything to do with the diet he just started? UPDATE: This group is now closed to new members. If you didn't get a chance to sign up, don't worry, the pattern will be available later this fall in a traditional pattern format. Its baaack! Mystery Stole 2 is getting organized right now. For those of you who aren't familiar with how Mystery Stole works, I'll fill you in. Mystery Stole 2oo6 is a knitalong using Yahoo Groups as a host site. 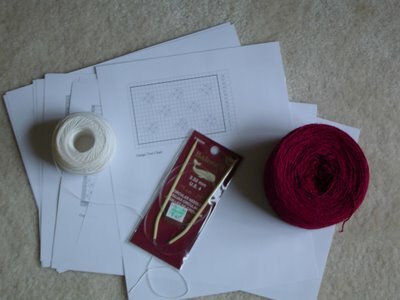 Beginning July 7, I will give you part of a design for a lace stole. This will continue for a total of 6 weeks, when you will have the complete design. You won't know what you're knitting, you just sign up, cast on, and knit. Last year's design was the Leda's Dream stole (you can see it by looking at Patterns For Sale in the sidebar). This time around I have created a design that can be more evenly broken up so that each week's knitting is the same amount. There is one other big change to the way I'm doing it this year versus last year - last year we allowed sign ups to the group for months after the knitalong had actually finished. This gave people who didn't hear about it at the first, time to wander over and join us, but it also meant that the discussion was pretty much all over the place as far as where everyone was in the knitting. This time, I will close the group to new members on July 14, the day the second clue is posted. I think that will keep the group more on track. The design will again be released as a finished, cohesive pattern for sale with pictures and some sort of bonus design for those that don't want to do the knit along or who want to know what they're knitting before they knit it, but the group members will be offered the pattern at a discount. Last time we had over 700 knitters join the knitalong. If you want to be a part of Mystery Stole 2006, make sure you join soon! Tell your friends, tell your family, tell anyone who you think would be interested because on July 14, the group will be closed. Thanks for all the compliments on the sock yesterday. I answered Regina's question in an update at the end of the post and as for the question about which increase I used, I used a Make One Right Slant every time. I see no reason why there couldn't be a lacy version of Melanie's Twist using Yarn Overs for the increases - just as an idea for another option. 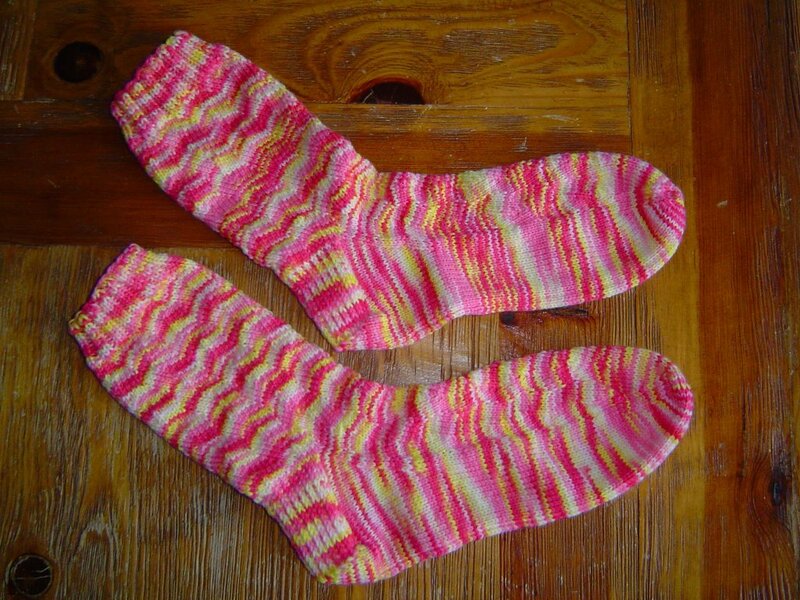 Sock Number One of the Pink Lemon Twisty Pair is finished! I finished it last night, but haven't cast on for sock number two yet - that's for today. I am so in love with this sock. I can't even begin to describe how much I love this stitch pattern. After seeing it in the subtle colors that my Sockapaloooza Pal used and then in these bright and crazy colors, I have to admit - I want to see it in a solid or heathered yarn next. 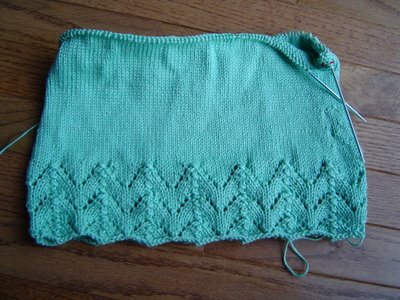 I know I won't get the horizontal zigzag scallops, but I should be able to clearly see the stitches twisting back and forth. Maybe this is one of those stitch patterns that does something interesting in any yarn! I almost didn't get to knit last night. I had a bit of a mishap. One of the accessories for the vacuum cleaner has a crack right where it connects to something else and it kept falling off when I was using it. Since I use it on the stairs, I needed to fix it. So, I got out the super glue, dabbed a bit on, squished it together and ... glued BOTH hands to the vacuum accessory (so NOT what I would glue both hands to if I was going to glue myself to something!). Mickael ended up using nail polish remover to free me, but I still have super glue on my fingers. I have never superglued myself to anything! I have a known tape problem - back when we were first married and getting out of college and still moving ourselves in Uhauls (once we even got a standard transmission one! Talk about vintage Uhaul), we of course had to pack all our junk before we could load the truck. Every time we moved I would end up taped to boxes, with my fingers taped together, cutting myself on the tape roller, and having other adhesive adventures. I'm wondering if this is Life's way of amusing itself since we now use professional movers (HUGE YEAH!) and my taping adventures are limited to just a few packages a year. Maybe I should just avoid all adhesives - always. Update: The color changes in this yarn are pretty short - around 4 - 6 inches is probably average. Some stretches are a bit longer but they are short and random. I don't think I ever knit all the way around the sock without changing colors. Does this answer your question Regina? Saturday I got some more combing done on Smiley's fleece. I now have a whopping 3 ounces combed! At the rate I'm going, I should finish combing all of this by the time I'm 50 or so. The combing is going pretty fast, it seems to be drawing off the top from the combs that's taking a while, but I noticed I was getting faster towards the end of the day. Hopefully, I can do some more combing this week and see if I really am getting faster or its just a hopeless attempt to tell myself that I am. 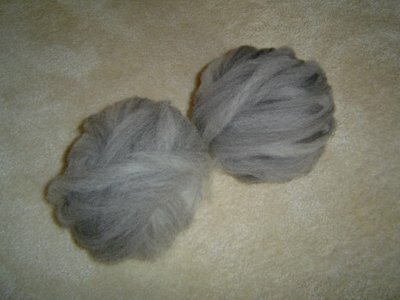 I'm making the little top balls 1-1/2 ounces each and plan to predraft several of them together before I spin, just to try to blend the greys a little more. I could do my blending as I comb, but I don't want to flatten the color, I just want it to read as a more uniform color in a knitted fabric. I haven't decided if I want to dye it or not, the grey is so beautifully silvery, I'm really thinking about leaving it the natural color. Of course I don't really know what I'm going to do with it yet either, and that might affect the finished color too. I've made it to the gusset on my Pink Lemon Twisty sock and I am just loving the way the yarn is working in this pattern. I'm pretty easy to amuse, but this is just fun watching where the colors are going to go and seeing the little patterns they make. It also makes me want to knit faster, unlike a certain top that's being knit in the round - ahem. 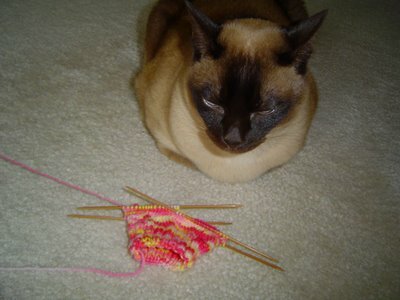 I'm glad I'm not the only one who feels like knitting something in the round takes forever. Its nice to know that I'm not alone with that particular brand of crazy. I also got a little non-knitting fibery thing done yesterday. 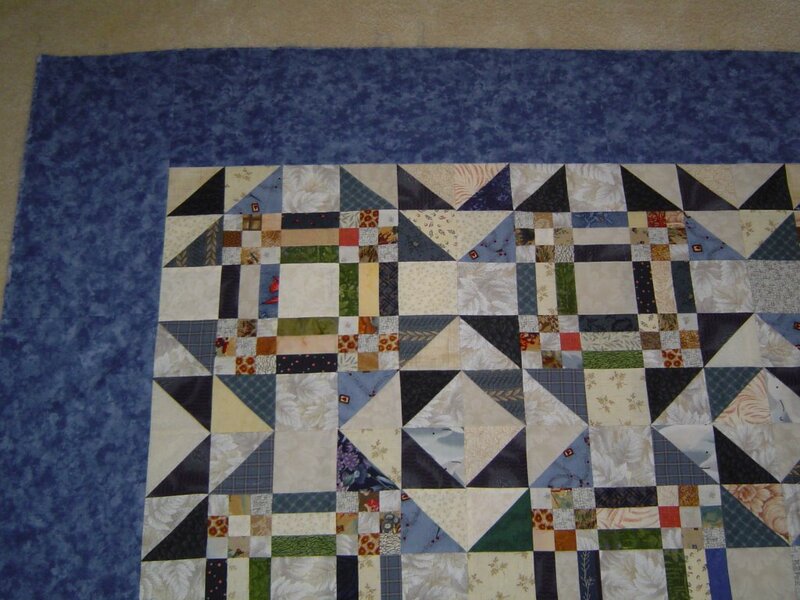 A long time ago, before I did very much knitting, I quilted. I actually worked at a quilt store - Quilt 'N Stitch. My quilting fabric stash is actually bigger than my knitting and spinning stash. I haven't done much quilting since Caleb was born because knitting is more portable and its easier to keep up with him that way. I do have some quilts that are WIP's, but they aren't ready to be quilted yet, and I'm going to be trying to get somewhere with them over the next few months. This top is one of them. I made this quilt top ages ago, but hadn't put borders on it. I had the border fabric. I also had backing fabric, and binding - I just had to put it all together. Last night I got my act together and finished getting it ready to quilt. I'm going to send it off to Quilt 'N Stitch and have them quilt it for me, so I can bind it and get it on Caleb's bed later this fall. Just in case you're curious, the block pattern is Goose in the Pond and I've done it with scraps of blues, greens and browns, on various white and cream backgrounds. I got some more done on Soleil last night. I'm in the middle of the increases. The thing that kills me (and my motivation) when I'm working in the round is that it takes twice as long to show progress. I know I'm getting both the back and front done at once and I won't have to seam things together in the end, but I do so much of my knitting flat, that I don't really feel like I'm getting anywhere. If I could have a front or a back done, it would make me feel like I was halfway done while, on this project, working in the round, I am probably halfway done, but it doesn't feel like it. Does anyone else feel like this when you're working in the round? Am I crazy? (Don't answer that one.) I love the color and the feel of this top, but I think its the lack of obvious progress that has made me so unmotivated to work on it. I know I'll wear the silly thing once its finished, I just need to get it finished!